‘They teach you how to love’: Meet the lion, tiger and bear who are besties. In what seems like a Disney movie come to life, a lion, a tiger and a bear have all become best friends at an animal sanctuary in Georgia. The trio is believed to be the only bear, lion and tiger that live together in the world, according to the manager of animal husbandry at George’s Noah’s Ark non-profit. Under normal circumstances, the animals would have never met because the bear is native to North America, the lion to Africa and the tiger to Asia. However, 13 years ago, when the three animals were still cubs, they were found in, of all places, an Atlanta drug dealer’s apartment. The exotic pets were seen as a status symbol. They were all in poor condition, but had formed a special bond under duress. The animals, native to three different continents, were found in poor condition in the apartment of an Atlanta drug dealer 13 years ago and formed an unlikely bond.he “BLT,” as they are known, live on a three-acre habitat but spend most of their time within only a few feet of one another Animals that would have been mortal enemies in the wild, the “BLT” can often be seen nuzzling and showing affection toward one another. The founder of the Noah’s Ark Animal Rehabilitation Center in Georgia believes the “BLT” can teach humans a lesson about friendship. The three animals live on a habitat of three acres at the non-profit Noah’s Ark sanctuary, so they could easily separate themselves, but they choose to spend their time close to one another. The founder of Noah’s Ark, Jama Hedgecoth, believes their unlikely friendship could teach their human counterparts a lesson as they wow visitors with their bond. 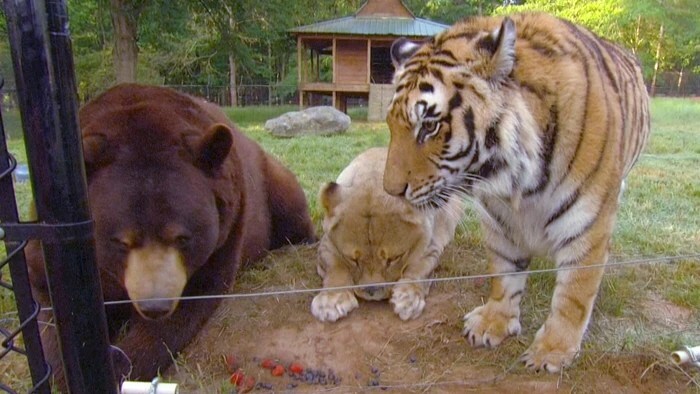 Comments Off on ‘They teach you how to love’: Meet the lion, tiger and bear who are besties.